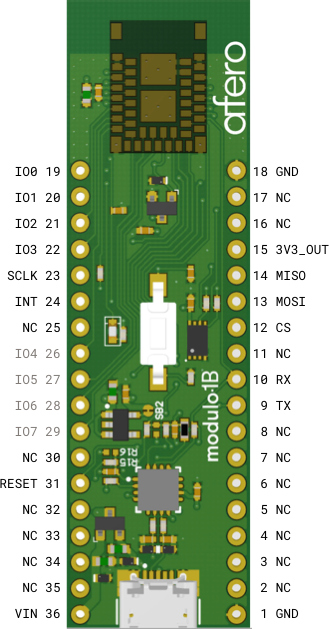 Modulo-1B-TY is a development board for the ASR-1B Secure Bluetooth® low energy radio architecture, based on the nRF52832 BLE chipset. The board uses the pre-certified Taiyo Yuden EYSHCNZWZ module plus the Afero Hardware Security Module. 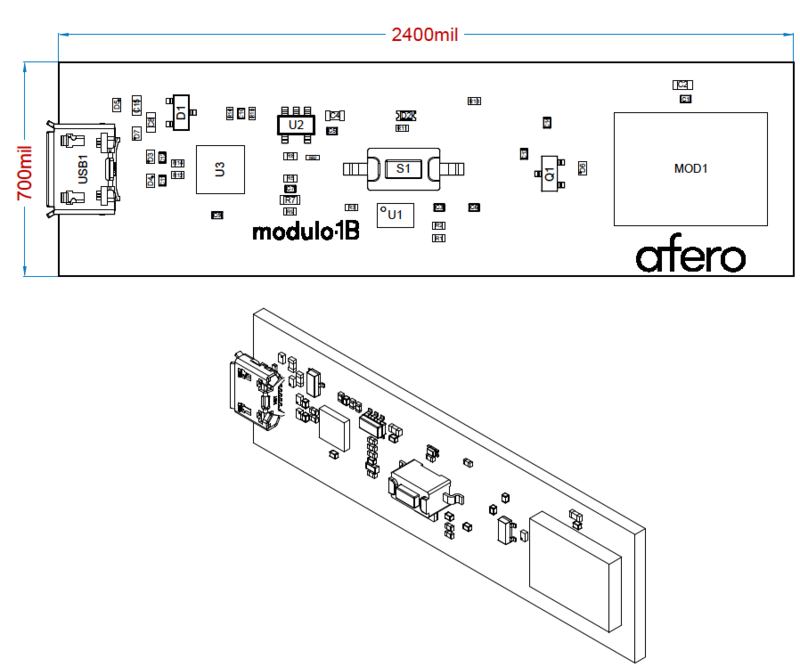 Modulo-1B-TY makes it easy to prototype and build connected products used in conjunction with the Afero IoT Platform. It enables ultra-low power connectivity for data communication. The product integrates a Bluetooth radio, RF front-end, a microcontroller running the Afero custom firmware, security IC, and crystal into a small package. This is an ideal solution for Internet of Things (IoT) applications. This data sheet is also available as a PDF file. SB1 LED(D2) is connected to pin IO0 and is active high. LED will turn on when the pin is set high. User can disconnect LED from the pin by cutting the SB1. SB2 User can measure current on 3V3_OUT rail by cutting the SB2 and applying current meter to each end of SB2. SB3 Button(S1) is connected to pin IO3 and is active low. Pressing the button will indicate input value 0. User can disconnect the button from the pin by cutting the SB3. Conditions: 25°C, VIN=5V, Parameters measured at RF connector. To preserve antenna performance, keep materials away from the antenna element. The dimensioned box shows an example antenna keep-out region. Infringing on this keep-out should be done with direction from an RF engineer to best retain RF performance. Complete Modulo-1B-TY design files are available at this GitHub link. The design files are open-sourced under the Apache 2.0 license. This device complies with Industry Canada’s licence-exempt RSS standard(s). Operation is subject to the following two conditions: (1) This device may not cause interference; and (2) This device must accept any interference, including interference that may cause undesired operation of the device. This product installs a radio system which has been approved as a radio station in a low power data communication system based on the Radio Law.